reverse shift pattern by flipping the stock shift arm. ABS-compatible. 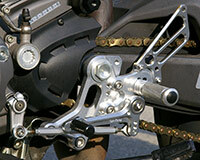 attaching the stock passenger pegs, and a matching adjustable SHIFT ARM.